Account Wagering on Horse Racing is the only legal online gambling in NY. The NYS Gaming Commission has allowed for telephone account wagering and now includes internet account wagering on horse races. If you are at least 18 years old (NY Residents) or older you may apply for an internet account through several Account Wagering companies. Some of companies may require you to be 21 years old as they offer other types of betting. Please read the FAQ and terms on each of the linked websites above. Bet on Fantasy Football, Fantasy Soccer, Fantasy MMA, Fantasy Baseball Teams . Legal Betting on Fantasy Sports Teams. Daily and Weekly Fantasy Sports contests for cash prizes in all of the five major sports (MLB, NHL, NFL, NBA and PGA) as well as college football and basketball. Our rapid-fire contests are a much shorter duration than the traditional season-long leagues and require no team management after the draft. Online Fantasy Sports Betting and Online Poker are technically contests of skill instead of “contest(s) of chance” . I’m sure there are many online gaming sites that accept NY Residents whether it is legal to or not… At some point we can only hope that Professional Sports Team wagering and online Poker will be specifically allowed in NY as it is now in New Jersey..
event of a certain outcome. Penal Law § 225.00(2). 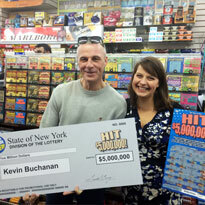 Yonkers resident Kevin Buchanan wins $5 Million Lottery Jackpot on Instant Scratch Off Game “Hit 5 Million”. He purchased the ticket at a convenience store on Yonkers Ave in Yonkers on Christmas Day 2014 and claimed the ticket on December 28, 2014 . He chose to receive his prize in one lump sum payment and will receive $3,235,132 after required withholding. NY_Lottery_Top_Prizes_1_26_2015 PDF file. This file shows the top prizes still available, as of 1/26/15, on all the instant lottery scratch off tickets in New York. In November of 2014 a press release by the NYS lottery revealed that there was only one winning ticket for the $326 Million Dollar Mega Millions Jackpot. They proclaimed it as the eighth largest Mega Millions jackpot ever and the the largest ever won in New York. In January 2015, an 80 year old retired elementary school principal from Wurtsboro NY, in Sullivan County, won the $326 Million Mega Million Jackpot in November of 2014. The largest lottery prize claimed in New York State lottery history. He opted for the lump sum payment and will receive approximately $197,000, 000 before taxes. 24 hours a day, 7 days a week. Call toll free 1-877-8HOPENY (1-877-846-7369).